I remember coming into my kitchen in my wheelchair for the first time after my spinal cord injury nine years ago. I was wearing a neck collar and body brace to stabilize my spine after surgery. I went to the kitchen sink to get a glass of water. The glasses were stored in the bottom shelf of the wall cabinet and were totally out of my reach. My husband Mark handed me a glass and I proceeded to go to the sink. I couldn’t reach the faucet to turn on the water. Mark came to my rescue again. Since I am the cook in the family, I need access to all the large and small appliances, sink, cook top, countertops, cabinets, drawers, dishes, pots, pans, storage bowls, and food. Frustration quickly mounted when I discovered that access was denied from my wheelchair vantage point. Even getting myself a bowl of cereal was challenging! A few months after I came home from the hospital, I began working with a counselor assigned to me from the Ohio Bureau of Vocational Rehabilitation. This state, and nationally-funded agency assists people with disabilities by providing products and services to assist them in daily living skills so they can return to work. We contacted an occupational therapist who came to observe me in my home and evaluate me working in the kitchen. She asked me how long we expected to stay in our home and if we intended to remodel it to make it more accessible. Mark and I built our home three years before my injury. We did not want to do any remodeling until we were sure about the permanent extent of my injuries. We were hopeful that someday I would not need the wheelchair and would be able to walk again. We only wanted to make simple changes to improve my kitchen accessibility. At the advice of the occupational therapist, we installed “Lazy Susans” on all the shelves that I could reach in the pantry closet. Since these platforms spin, I was able to reach any can or box of food. For items stored on the taller shelves that I couldn’t reach, I used a long-handled reacher. We moved lighter items like cereal and crackers on the top shelf so they would be easier to grab with the reacher. If they ever slipped out of the reacher and fell on top of my head, light boxes wouldn’t be as painful as large cans or glass jars! Mark installed full-extension wire basket shelving in the countertop base cabinets. I was able to fully extend these wire baskets to easily retrieve my skillets and saucepans. Fortunately for me, there is a 30-inch high countertop at our built-in desk in the kitchen. It provides ample knee space underneath so I can roll under this counter to chop and mix food items. The other countertops are 36 inches high and more difficult to use. We rearranged items on the kitchen counters so that knives and cutting boards are next to the desk. We also moved many of the bowls and cups to the pull-out shelves in the base cabinets. We utilized the lowest shelves in the wall-hung cabinets over the counters for glasses and dishes. My two-door refrigerator had the freezer compartment on top, making it very difficult for me to reach many items inside. Looking back, I should have replaced this refrigerator/freezer immediately rather than waiting eight years. This would have saved me time and aggravation and allowed me to be more independent cooking meals. I was pleasantly surprised when I found a used side-by-side refrigerator/freezer for $200. After it was installed, I was amazed at my ability to reach everything inside. I positioned a Lazy Susan on the top shelf of the refrigerator so that I could see what was on this shelf and have access to it. All of these modifications improved accessibility for me as well as for Mark. The benefits more than outweighed the minimal costs to purchase the wire basket full extension shelves, Lazy Susans, used refrigerator/freezer, and reacher. I am grateful for the occupational therapist that pointed out these simple changes that make all the difference during meal times. Rosemarie Rossetti, Ph.D. is building a national model universal design home in metropolitan Columbus, Ohio. She is an internationally known speaker, trainer, consultant, and writer. To contact Rosemarie go to: www.RosemarieSpeaks.com. 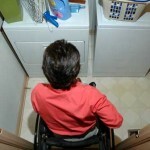 To learn more about the Universal Design Living Laboratory go to:www.UDLL.com. 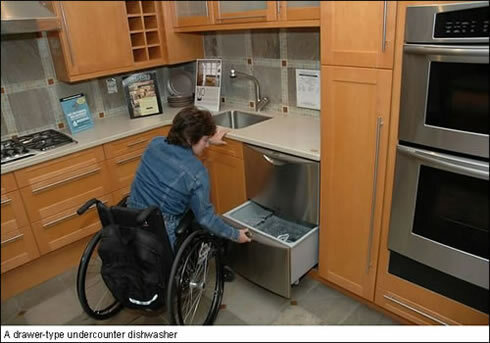 Universal Design – Is Your Friend’s Home Visitable?